The Ku Klux Klan, the nation’s largest white supremacist group, has distributed recruitment fliers to residents in Maine and North Carolina, spurring fears of increased hatred in an already-tense political climate. Jack May discovered the fliers while jogging near his home in Freeport, Maine Monday morning. They depict a hooded figure in a Klan robe with the letters “KKK” shadowed by flames, proclaiming that the group is providing a neighborhood watch, allowing residents to “sleep tonight knowing the Klan is awake! Are there troubles in your neighborhood? Contact the Traditionalist American Knights of the Ku Klux Klan Today!” The fliers were wrapped in plastic sandwich bags, weighed down with pebbles and placed at the ends of driveways. The speaker of the house for the Maine legislature, Sara Gideon, lives down the street from May. While she didn’t receive any fliers, she said she was disturbed and angry, but also determined to keep the KKK out. The fliers aren’t illegal, other than being litter, Freeport Police Chief Susan Nourse said. “It’s an informational flyer, so it’s letting people know what the phone number is and that the organization exists,” she told the Bangor Daily News. In Gaston County, North Carolina, several families received fliers over the weekend. Robert Hord’s wife found one in their Cherryville driveway on Sunday. "It was rather stunning, to say the least," Hord told the Gaston Gazette. "I would've hoped the world would've been a bit further past that, but I think that's probably just the hope." In nearby Dallas, Shiela Johnston's son discovered a flier while riding his bike in the neighborhood. "It's just scary," Johnston told the Gaston Gazette. "It's scary to look at. It's scary to think there are people like this skulking around our neighborhood." Her son called the Indiana-based phone number on the flier, and was greeted by an expletive-laden voicemail that railed against African-Americans and refugees. It also asked callers to leave their name and address. @realDonaldTrump KKK flyers in Maine. Donald Trump, you are what is making America dangerous again, you should be jailed for life!!! Back in Maine, May blamed President Donald Trump for emboldening the white supremacist group. 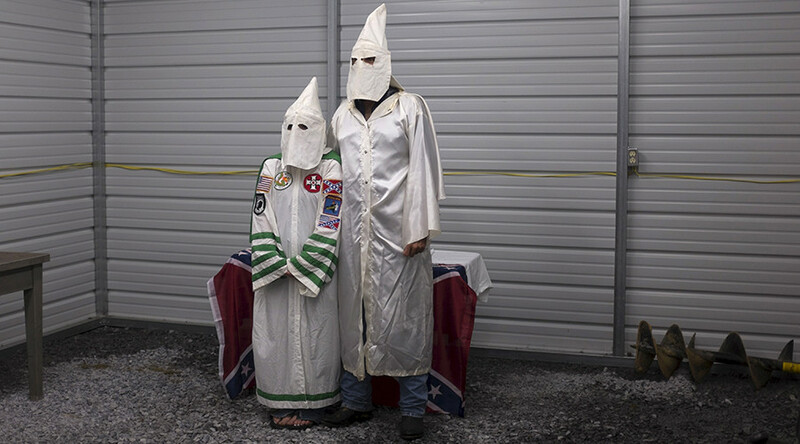 The Southern Poverty Law Center, which monitors hate groups, estimates that there are between 5,000 and 8,000 Klan members in the US today, spread among nearly 200 different groups. The KKK is the largest active hate group in the country. 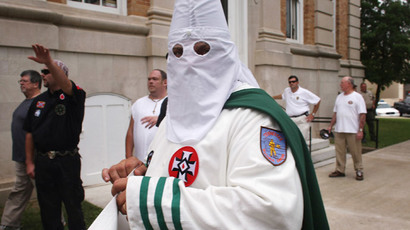 Several KKK chapters have been actively recruiting over the last few years. Last January, residents in at least three states ‒ Alabama, California and New Jersey ‒ received similarly packaged material ahead of Martin Luther King Day, promising the group was white people’s answer to the NAACP, La Raza and the Jewish Defamation League. In August 2015, fliers were found in a suburb of Detroit, Michigan, that depicted a cop in KKK gear pointing a gun at a black child and encouraging white people to vote for white candidates and “get the blacks out.” In July 2014, KKK promotional material in South Carolina included candy.